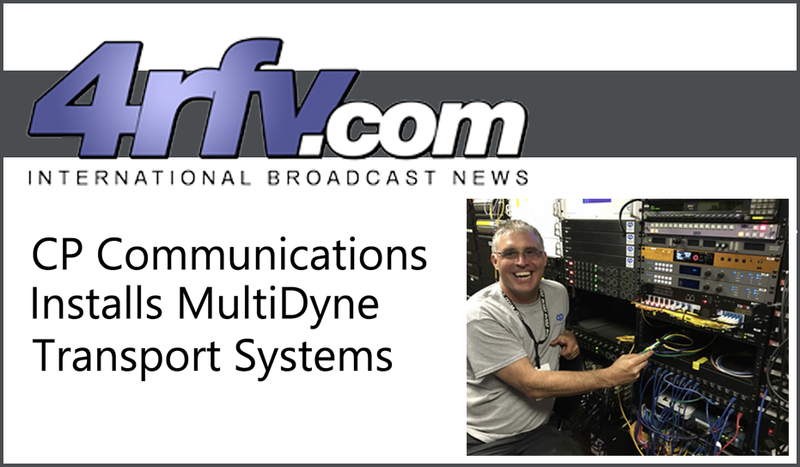 CP Communications has installed multiple VF-9000 bulk fiber transport systems from MultiDyne Fiber Optic Solutions. The VF-9000s are installed in CP's flagship HD-11 and HD-21 RF production trucks and solve the per-show scalability, performance and technical limitations of its previous fiber solutions. The VF-9000 enables a host of new technical services for CP Communications, including support for native 3Gb/s signal transport on HD-11 and HD-21. 3Gb/s transport is a requirement for the high-profile sports productions that CP Communications routinely handles for FOX, NBC, and The Golf Channel. The VF-9000 allows CP Communications to natively accept 3Gb/s camera feeds over RF into its fiber transmission infrastructure, and is downward compatible for standard HD feeds. Operationally, the VF-9000 outperforms their previous fiber transmission platforms in several important ways. This includes the flexibility to hot-swap, add or reduce SFPs to meet specific production requirements – a limitation of the previous system, which required connecting drop-down units, including external multiplexers, to the main frame. The VF-9000's value proposition is extended through automatic recognition of SFP module connections as inputs or outputs, as well as by format and application. The flexible architecture allows CP Communications to have an imbalance of input and outputs based on the needs of each production, instead of being limited to a certain number of each. In addition to video and Ethernet SFPs, the VF-9000 allows their production teams to transport MADI audio as part of the video feeds. Following automatic recognition, the VF-9000 then transitions to the proper setup upon coming online, eliminating additional configuration steps. "There is enormous value in not having to manually communicate what is an input versus an output during configuration," said Kurt Heitmann, CEO, CP Communications. "Live production moves very fast, and the VF-9000s automatic recognition features remove what was often a very time-consuming process. Before, the process required adding an SFP and assigning it to the corresponding BNC, and then programming the connection as an input or an output. In addition, my cable lengths are now shorter, and there is no need to re-patch the entire system from show to show." The VF-9000's scalable flexibility complements its unmatched signal density. The compact units deliver robust multiplexer features, effortlessly combining up to 18 signals over one single-mode fiber for efficient, high-density signal transport. At just 1RU, the VF-9000 returns valuable two rack unit spaces that the previous systems absorbed in each truck, freeing more space for additional RF gear. In both trucks, the VF-9000 seamlessly integrates within the complete RF infrastructure, which includes a high-density routing system, mesh technology, and wireless cameras and microphones. The VF-9000 also seamlessly connects to signal monitoring systems on both trucks, allowing operators to keep an eye on the health and performance of each feed and connection. "MultiDyne has simplified our entire fiber operation, and has done so at a very attractive price point," said Mr Heitmann. "They are clearly a very service-oriented company, with the robust performance and high product quality to match."